Aerion continues development of its eight- to 12-seat, Mach 1.6 supersonic business jet. The company says its has $4 billion in orders for the future jet and is seeking manufacturing partners for the project. Supersonic business jet developer Aerion Corp. (Booth No. N5707) says it has gained traction among aircraft manufacturers with its new aerodynamics consultancy–Aerion Technologies–since the subsidiary was launched in May at the European Business Aviation Convention and Exhibition (EBACE). 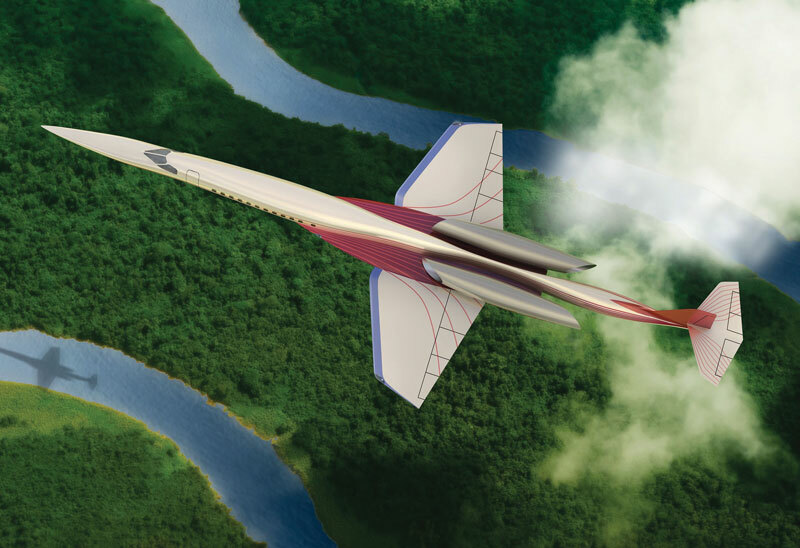 Aerion Technologies was formed to help original equipment manufacturers (OEMs) apply its natural laminar flow (NLF) airfoil design expertise for faster and more efficient subsonic aircraft. Aerion, based in Reno, Nev., says it has developed one of the industry’s most extensive portfolios of NLF test data and methodology for aircraft design, manufacture and operation. Launched in 2002 and led by billionaire businessman and philanthropist Robert Bass, Aerion continues engineering development of its own design–the eight- to 12-seat, Mach 1.6 Aerion supersonic business jet (SBJ), although the company had no manufacturing partners at this writing. Aerion says it has $4 billion in orders for the future jet, based on letters of intent (LOI) backed by $250,000 refundable deposits. The LOI establishes a base price for the SBJ of $80 million in 2007 dollars; identifies a base configuration for the aircraft, including range, maximum weight and general interior configuration; and ensures a delivery position. Aircraft deliveries would begin five to six years after the formation of a joint venture to complete SBJ development, production and certification, the company has said. Last year at the NBAA convention, Aerion announced preliminary results of five data-gathering flights using a flat-plate aerodynamic test article mounted on an F-15B fighter operated by NASA’s Dryden Flight Research Center. Static pressures recorded at 60 points on the flat plate at varying speeds and altitudes were compared with values predicted by aircraft computer models. The test flights were designed to map the flow field under the F-15 in order to calibrate instrumentation for the next test article, which Aerion plans to fly by year-end, subject to the availability of NASA’s aircraft. As Aerion continues its pursuit of the SBJ, a newer venture has joined the field of supersonic business jet developers. At the Paris Air Show in June, HyperMach Aerospace Industries unveiled plans for the SonicStar, with a blistering cruising speed of Mach 3.5. “I think the fact that there are other entities that are talking about the need for speed and a market for that type of airplane just lends credibility for what we’re doing,” said Barents.